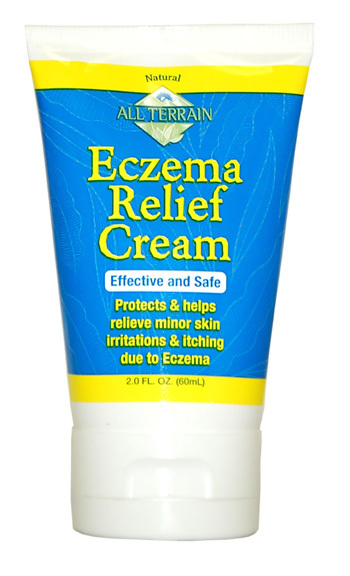 Eczema Relief Cream, 2 fl oz / 60ml (All Terrain Co.) - Penn Herb Co. Ltd.
All Terrain Natural Eczema Relief Cream temporarily protects and helps relieve minor skin irritations and itching due to rashes and eczema. Using natural ingredients, it provides safe and effective relief by soothing dry and sensitive skin area that needs special care. INGREDIENTS: Active Ingredients: Colloidal Oatmeal USP (1.0 %) ….. Itch Relief. INACTIVE INGREDIENTS: Aqua (water), Capric/Caprylic Triglycerides, Zea Mays (Corn) Starch, Kaolin, Stearyl Alcohol, Glycearyl Stearate, Glycerin, Squalane, Zinc Oxide, Gluconolactone & Sodium Benzoate, Xanthan Gum, Allantoin, Aloe Barbadensis Leaf Extract, Citric Acid, Butyrospermum Parkii (Shea) Butter, Potassium Sorbate, Alpha Bisabolol, Essential Oil of Eucalyptus Globulus and Melaleuca Alternifolia (Tea Tree), Neem (Azadirachta indica) Oil. Paraben Free. Cruelty Free . Temporarily protects and helps to relieve minor skin irritations and itching due to rashes, eczema. Non-irritating. Apply as needed. For external use only. 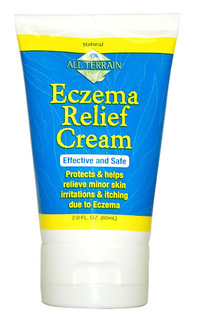 For best results, use in combination with All Terrain Eczema Soothing Soap and/or Eczema Relief Spray. WARNINGS: When using this product keep out of eyes, rinse with water to remove. Stop use and ask a doctor if: conditions worsen, symptoms last more than 7 days or clear up and return within a few days.